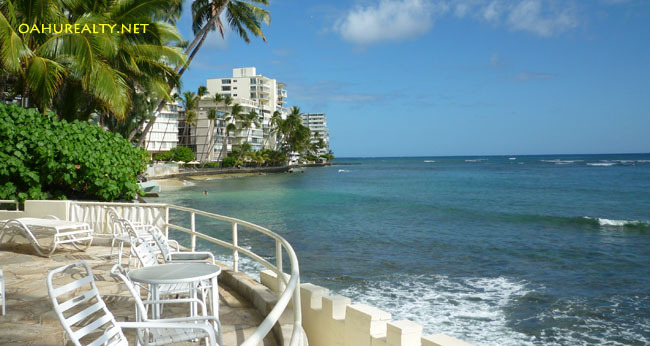 Castle Surf Apartments is located directly on the water at Diamond Head. Constructed in 1960, Castle Surf Apartments is six stories tall with 38 units. The "01" units are on the water and the "09" units are closer to Kapiolani Park. 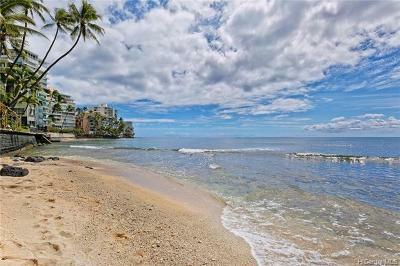 Castle Surf Apartments have direct access to Diamond Head's sandy beaches via a keyed gate. There's also a patio area for residents to relax and view the ocean. Castle Surf Apartments are located at 2937 Kalakaua Avenue. Drive down Kalakaua towards Diamond Head. When you see the water fountain on the left, Castle Surf Apartments are directly to your right (just after the Elks Club). Castle Surf was named after surf break "Castles". The surf break is named after the Castle family. In 1899, James Castle built a residence in this area and named the house Kainalu. After James Castle died, his wife sold the Kainalu property to the Elks Lodge and the Lodge is still in that location, several buildings away from Castle Surf.